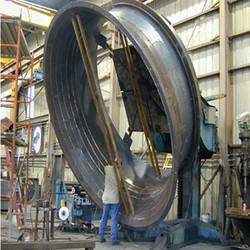 Manufacturer of a wide range of products which include steel fabrication services. Delta is among the leading companies engage in premium quality Steel Fabrication Services. Our in-depth expertise in this domain helps us deliver unparalleled quality of end product in good turnaround time. Our highly skilled and experienced engineers precisely execute these Fabrication Services as per client’s demands and expectations. We are looking for queries from the companies looking to off-load fabrication work, be it PEB Primary framing system, Secondary Framing system, heavy structural steel fabrication or any kind of steel related job work. Our feasible price range makes us the first choice for clients. Rendered at par with the industry set quality values and principles, we go all the way to ensure timely deliveries while at the same time maintaining high standards of quality. The state-of-art manufacturing facility at Kadapa, Andhra Pradesh. PEB production capacity of 30,000 MT per annum (planned to scale up to 50,000 MT). Looking for Steel Fabrication Services ?